Who will have the best nba career from the 2015 team? So, we've got Jah, Tyus, Justise, Grayson, Quinn, Amile, MP3, and Semi to choose from? So far Jah has had the best single season out of that group, though he hasn't gotten much love since. Justise has had the best "improvement arc" so far, and just made the most money out of that group. Tyus is highly beloved by the MIN fan base, or at least they want him to play more than the coach is willing (and then they signed D-Rose to lessen T-Jones' role on the team? savage). Quinn is the only one on the list with a championship! MP3 has already far surpassed expectations by even playing in a single game, let alone play in 2 separate seasons and score a total of 54 pts. Semi had a surprisingly good year as a rookie, in that he contributed at all, which was beyond expectations when he left Duke. Only Amile and Grayson have yet to play in the NBA. My bet is on Winslow having the best NBA career of the bunch due to his athleticism, versatility and improvement shown so far. Out of that whole group, he's also the one that seems to have the closest to what could be called star power. In a different era, maybe Jah could have been a star, but today's game isn't for him. Yet if he could develop a respectable (33%+) 3pt shot, the story on him could change quite a bit. Tyus seems to be destined to be a back-up PG, maybe a starter as he gains experience. Ditto for Quinn. Amile and MP3 seem destined to be back-up bigs. Semi seems like a "poor man's" Winslow, 3&D all the way. Grayson could blow people away, a la his teammate D-Mitch, or he could drift in to that mosaic of guys with great talent but who just didn't have enough of "it" to make it in the show, a la Jimmer. The answer also, to bluntly introduce dollar signs, is who gets a lucrative second contract? The Chief Justise is the only one sure to make the honor roll. School is still in session for everybody else. Grayson is the wildcard here. 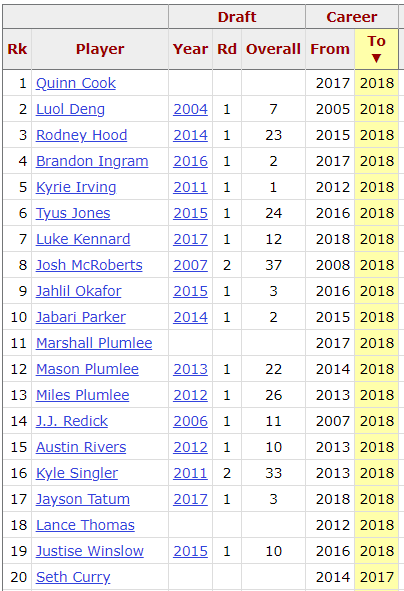 All of the rest have been beaten down to one extent or the other by the reality that there are a lot of pretty good basketball players floating around. The NBA season starts tonight. I'm definitely looking forward to seeing the first game with all the Dukies involved. I’ll be surprised if the Celtics look bad, because they have Brad Stevens. Credits to all. Carter! Deemed best player of the summer season. Wow!! Indeed it is. I am so proud to have Jayson Tatum in the NBA representing Duke. Is there anywhere I can find a consolidated listing, by team, of Dukies in the NBA? I suppose I can take a few minutes to do the research and list which teams they play for. I can sort it then and post it back here. I just haven't spent any time to keep up or know what teams they are with off the top of my head. I'm doing a NBA fantasy league this year for the first time. We had our draft over the weekend. 12 teams, 13 players per team is 156 total players. This is not a league with a bunch of other Duke guys. It is just some friends from around the country. So, when I tell you about the draft, please know that there was no bias going on. We drafted exactly one UNC guy, Harrison Barnes. We drafted 10 Dukies (Tatum, Kyrie, Hood, Ingram, Parker, JJ, Rivers, Justise, Marvin, and Wendell). Look at Luol. I missed where he ended up back with Tom Thibodeau in Minnesota?!? One of three Dukies from the Aughts, along with JJ and Josh. ETA: or is Josh done? I looked for where he played, and saw that he was waived by the Mavs. Last edited by cato; 10-16-2018 at 04:14 PM. I am pretty sure Singler is out. Singler is playing in Europe. I suppose he could came back. Hopefully, Amile Jefferson will see some league time. I'm not sure the status of Gerald Henderson. Still a free agent and when I talked to him this summer, he seemed pretty sure he was going to be signing with someone. So, fingers crossed on that one. Tatum off to a hot start.